As in nearly every jihadi attack in America since 9/11 – those thwarted and those which have succeed in their evil plans – the jihadis were trained at a Muslim Brotherhood organization, the FBI is “still looking” for a motive, anti-American groups like the ACLU and the Southern Poverty Law Center side with the terrorists, the media focuses on ensuring Muslims are not offended and turns to Hamas (doing business as CAIR) for advice, and the root of the problem is – yet again – ignored. One Muslim Brotherhood (MB) leader in Phoenix, Arizona – Usama Shami – confirmed the two jihadis who were killed in Garland, Texas attended Shami’s MB Islamic Community Center of Phoenix (ICCP). Shami specifically stated he knew both shooters well, especially Elton Simpson, and that Simpson had attended the ICCP for over ten years. The property for the ICCP is owned by the bank for the Muslim Brotherhood in North America – NAIT (North American Islamic Trust). NAIT was identified as a Muslim Brotherhood entity and a financial support organization for Hamas (a designated terrorist organization) in the largest terrorism financing and Hamas trial ever successfully prosecuted in American history (US v Holy Land Foundation for Relief and Development, Dallas, 2008). Reminder: Hamas IS the Muslim Brotherhood in Palestine. Click here for U.S. Government filing in HLF regarding NAIT (specifically pages 7, 12, 13). The FBI was investigating NAIT back in the 1980’s for being a part of the Ikhwan (MB) in America. The Imam of the ICCP is Sheikh Mahmoud Abdul-Aziz Ahmad Sulaiman, who has been at the ICCP since 2002. Readers may remember his name because he was one of the “flying imams” who filed a lawsuit in 2007 against US Airways for allegedly showing discrimination in removing them from a flight after the imams’ suspicious behavior raised alarm among crew and passengers. Sulaiman is a 1992 graduate of Al-Azhar University in Cairo, Egypt – the most pre-eminent and oldest school of Islamic jurisprudence on the planet. As the leading authority on sunni Islamic jurisprudence, Al Azhar states it is obligatory for Muslims to wage jihad to destroy the Dar al Harb (house of war) until only the Dar al Islam (house of Islam) remains and only Sharia is the law of the land. The MB’s strategic documents also say MB Islamic Centers are the “axis” of their Movement to “supply (their) battalions.” They go on to say their Islamic Centers are like the first Mosque in Medina which Mohammed established. That mosque was where they stored food, water, ammunition and weapons. It is where jihadis lived and trained. It is where battles were planned, and was the place from which battles were launched. The MB states this is the function of their Islamic Centers in America. 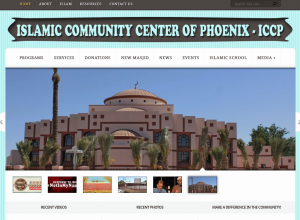 The Islamic Community Center of Phoenix is an MB front and two of its longstanding members committing jihad against non-Muslims in accordance with Sharia. What else would you expect? It is interesting that when Shami spoke with the LA Times he said he had not seen Simpson in a month, but later in the above video interview that time was extended to two to three months. Will we believe him or the doctrine the MB states his Islamic Center adheres to? Nearly every jihadi who has launched an attack on U.S. soil since and including 9/11/2001, as well as those attacks which were thwarted by law enforcement, has been “radicalized”, trained, funded, and/or supported by one of the thousands of Muslim Brotherhood organizations across the United States. From the Muslim Students Association (MSA), the Islamic Societies, Islamic Centers, Muslim American Society, and so many others, jihadis are launching jihad on our home turf and the very organizations and individuals leading those organizations are getting a free pass. When will the arrest warrant for Usama Shami be issued for material support of terrorism? How about shutting down the ICCP, seizing its property, taking its money, and bulldozing it to the ground? How bad will it have to get before you decide enough is enough, America?